As shown today in Ilya Grebnov, and Stephen Siciliano’s Build 2015 Session titled simply “Logic Apps”, there is now (as of the 29th actually) a nice project template for creating a deployment project containing a Logic App with separate per-environment parameters files. 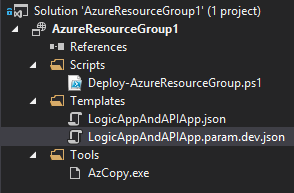 The deployment project is really scoped higher than the Logic App itself, it is instead a definition for an Azure Resource Group to be provisioned by Azure Resource Manager. 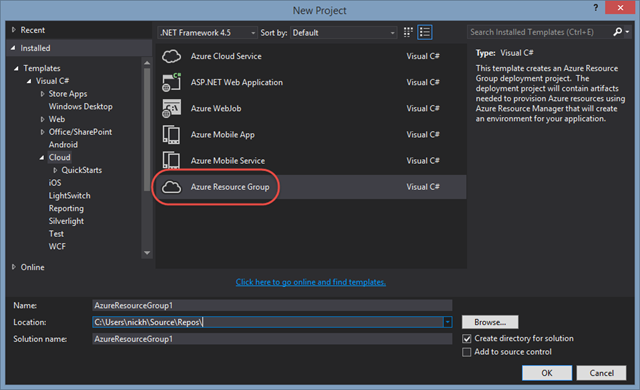 Selecting the project template (found in the Cloud category as Azure Resouce Group) launches a dialog asking for the type of resource(s) that you would like the resource group project to start with. 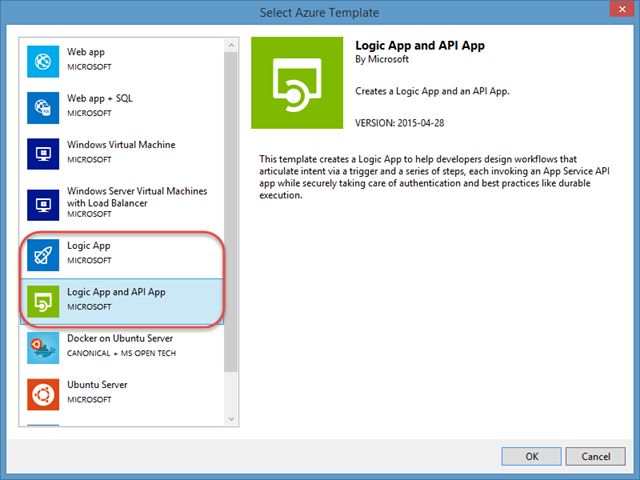 There are two resource types that include Logic Apps: Logic App, and Logic App and API App. Once created, the project (like any other Cloud Deployment Project up to this point) contains a PowerShell script to perform the actual deployment, along with a helper executable named AzCopy.exe. 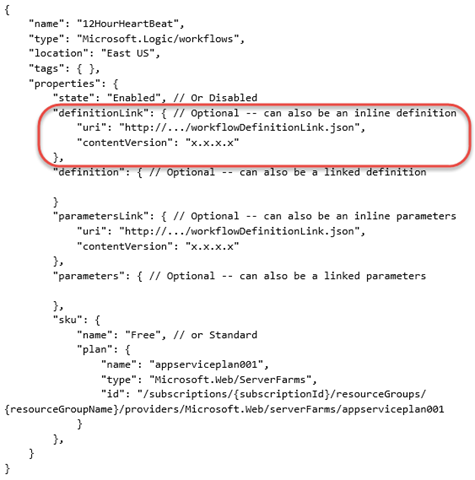 However, in addition to that, we not only get a file describing the deployment of an App Service Plan, Gateway, API App, and Logic App, we also get a parameters file — initially for a dev environment, but it is a step in the right direction and shows how to make it happen. Inside, you will find the parameters apiAppName, gatewayName, logicAppName, and svcPlanName. It consists of a recurrence trigger (polling very hour) that invokes an operation with id of getValues on the deployed API App and outputs an array containing the value of the readValues property on the body of the API App response. I guess that’s the “Hello World” of the Logic App world, eh? This represents a big step in the right direction for the team building Logic Apps. It’s putting code where code belongs, in the best IDE ever made and backed by proper source control. It also cleanly separates logic and configuration, enabling multiple environments. However, without a visual editor, and an/or an quick/easy way to resolve API App ids from the marketplace, it’s going to be tough to build more complex flows in this fashion. I would also like to see the deployment spread across files. Imagine a resource group with multiple Logic Apps (a receive pipeline style Logic App, a process orchestration-style Logic App and a send pipeline style Logic App), working with that in one giant file would be a little bit painful. I know that I wrote a lot for each of the major BizTalk events over the last 6 months, but for Build 2015, I’m going to keep it short and sweet and to the point. I’m juggling a lot of really cool things right now that I’m excited to share with you as soon as they’re ready. So stay tuned! As a side note, BizTalk Server on-premise is going to be getting some love over the next year as well. Another major version is in the works, and you’d better bet that I’m going to be all over that as well.